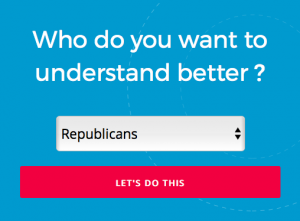 As we contemplate the so-called ‘filter bubble’ – our hermetic audiences of like-minded people – and how it has recently had such inordinate impact on our political and social culture in the election cycle of 2016, people (meaning us, creatures who seek ease in our digital lives) are tempted to adopt software fixes and tweaks to our Facebook community. Other folks are interested in how to make their bubble more tangible, more real, an actual community. Continual protests large and small in major cities are translating this interest into mass spectacle. But after the photos are tagged on Facebook and the crowds disperse, is there any lasting effect? Has community occurred? 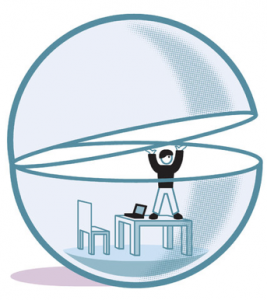 can be seen as a model for reframing virtual engagement (the Facebook bubble) into physical community (actual people, albeit still inbubbled with their likeminded peers). What to do: read the Guide (online, offline, English, Spanish), to gain intelligence. 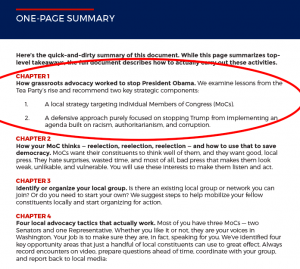 The methodology in the Guide has its roots in the proven effectiveness of Tea Party activism. Where to go: suit your locale, time or affinity –find or create a community. 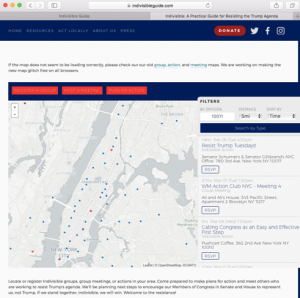 There are over 50 groups local to NYC that are registered with the Guide. 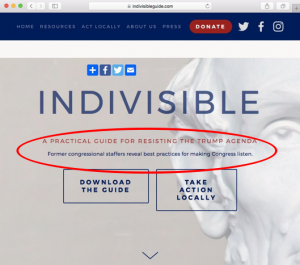 An individual joining or creating a local group is a big step in the direct action purpose of the Guide, as opposed to an individual’s passive participation in just registering their email, or even donating. These of course have value to IndivisibleGuide but not to its goal of leveraging direct citizen action, nor to the social side effect of creating real world community in local groups. 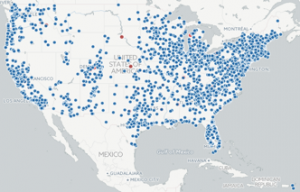 “Today, indivisibleguide.com has been viewed 17 million times. The original Guide has been downloaded over 2 millions times. Note that the Guide does not create local groups. But it can mark as a success, the sprouting of hundreds of local groups across the US. The core value of direct engagement with each citizen’s 2 Senators and 1 Representative is very much a realpolitik approach to change. This working within the system can be viewed by some as an unacceptable compromise of the sort that put Hillary Clinton ahead of Bernie Sanders and lost the Electoral College. Messiness is endemic to organically arising communities – there is tension between leadership and membership, a tendency towards chaos, difficulties with priorities, concern about failure to progress or the seeming failure to progress, and drop-off, burnout and fatigue among members. Furthermore, a host of affinity issues clamors for the attention and direction of members and their local groups, and emotions are strongly stoked by the sitting administration’s media tactics. Not to mention fear of infiltration, and for the future. But these are the messes of real-world organizing. Summing up in terms of urbane and spatial intelligences, the Indivisible site and Guide are simple and effective digital interfaces for enhancing smart citizenry and physical community. Jeffrey is a media professional interested in ideas, technology and immersive creative experiences. The image is a photograph of a hologram.